Weaving to Winnie Henry–a handsome, wise and determined Navajo woman–is to weave together the pieces of your own life. Every portion of weaving is a representation of Life. The whole part of setting up the loom is the Universe. Every living plant on Earth lives for a reason. Forward, backward living is Future. What’s in Life is all up to you, once you learn your Right and Wrong. “Weaving to me is keeping my art. There is a legend behind it given to us by Spider Woman. She gave the art in a spiritual way.” The deeper meaning is not shared in public. Winnie was told to do so might cause her to loose her art. Her dark brown, almost black eyes radiate a depth and a quiet sense of power and strength as she speaks. 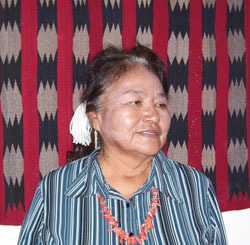 Spider Woman instructed the Navajo women how to weave on a loom which Spider Man told them how to make. The crosspoles were made of sky and earth cords, and sheet lightning. The batten was a sun halo, white shell made the comb. There were four spindles: one a stick of zigzag lightning with a whorl of turquoise; a third had a stick of sheet lightning with a whorl of abalone; a rain streamer formed the stick of the fourth, and its whorl was white shell. Young girls that want to weave have to be initiated. Then they can learn from a wiser woman who will share sacred stories for her to hold within her heart. You are being blessed by the Holy people. They are proud of you. You keep believing it and doing. “Art is life to me.” Upon returning from her boarding school years, Winnie knew weaving was valuable. She realized it could be an art that died and knew she had to keep it. Winnie continues today to weave many traditional patterns such as the Chinle, Lightning, Two Grey Hills, Yeibichai, Chiefs, Ganado Red, Big Star, and Storm. (Photos of these rugs.) This is her personal expression of beauty–a harmonious synthesis of elements that expresses activity, movement and energy. Every part of weaving represents something like thoughts within the mind. “When we do a good pattern, a good design, it makes a train of thought.” With each new woven creation, her own thoughts become clear and focused as she plans, organizes and begins visualizing the pattern in her inner eye. All of this was given to women as part of weaving along with skillfulness, exercising the hands and fingers, strengthening the back, keeping the posture straight. Winnie learned watching her Mother weave and from years and years of practice. She remembers how fast her Mother wove knowing she had to provide support for 9 children. “My Mother told me if you know how to weave, you will never starve.” During her Mother’s time every part of the weaving process was done by hand beginning with sheering and cleaning the wool to cording, spinning and dying the wool. It took all day to set up a loom. “I wanted to learn, I wanted to be like my Mother.” If there is more than one daughter, an older woman can tell who will become a weaver. Winnie, however, had only brothers–8 of them. Growing up in a earthen-floored hogan, she helped her Mother with the daily cleaning, water hauling and cooking. Each day the sheepskins they slept on had to be taken outside and shaken out. She also rode horses, herded sheep and learned to be strong in all ways. “Somebody made me be born right in the middle of 4 boys ahead and behind me for a reason,” Winnie says with pride. “I cried a lot of times, why me? I was trained to be tough.” Even today she walks the trails in and out of rugged Canyon de Chelly and lives in a remote hogan. Winnie’s own birth was very dramatic. Her Mother came into labor on a cold March morning, 1945, at 3 am in their isolated Canyon de Chelly, Arizona hogan. It took her Father more than half an hour to catch and saddle the horses. As they started up the 600 foot canyon wall on the White House Trail (which is much rougher than the well graded trail of today), her Mother, Rose Henry, was having contractions. Rose stopped and got off the horse and Winnie popped out and landed in the snow. All her parents saw was steam rising from the snow surface. Her Dad quickly dug her out and wrapped her in his shirt. He bundled Mother and daughter up and rode to her Great Grandmother’s hogan, which unfortunately was locked. But he found a sharp can lid with which to cut the umbilical cord. Then he rode for help and the hogan key. He came back with her Grandmother who spanked her and gave Winnie her Navajo name which is only used in communicating with the Holy Ones. It is the name they know her by. Later they went to the Ganado Hospital which is about 65 miles away and the nurse there gave her the English name she carries today as her public name. Growing up speaking only Navajo, her parents hid her from the Bureau of Indian Affairs people who came to take the kids away to boarding school. Winnie’s parents believed a girl did not need an education in white men’s world. So whenever she would be coming back to the hogan with their sheep flock, if a BIA vehicle was there, she was told to hide and wait until they left. At age 15 she finally was sent to boarding school in Ship Rock, New Mexico where they cut her hair, forbade her to speak Navajo or practice her religion. “I thought they were mean. I got homesick and became ill with high fever and almost died.” For the next 10 years, Winnie, an “over-age” student who did not fit in, was sent to boarding schools in Shiprock, Ft. Wingate and Albuquerque, New Mexico and Phoenix, Arizona. Her last year a high school was opened in Chinle so she was able to graduate in her home town. Chinle is a large Navajo service center town built at the mouth of Canyon de Chelly. I witnessed people with alcohol problems. I feel like it is not their fault they started drinking. They were never told what my Mom and Dad told me. How to keep my center of faith. You have to be an example if you want to help people with addiction problems. I refer back thousands of years to First Woman and First Man. Generation to generation, never written. Mistakes were made, corrections were made. I also read the Bible three times as an adult. To me the Old Testament is very similar to our legends. I used to teach Sunday School.